* Utilizes rotationally molded, cross-linked polyethylene plastic, allowing for complex shape designs beyond conventional and restricted aluminum tanks. * Our fittings hold the highest O.D. and I.D. tolerances in the industry, ensuring you the highest level of input flow available during tank refueling. * Machined aluminum 3/8" withdraw fitting has 360° rotational capability for hook-up convenience. 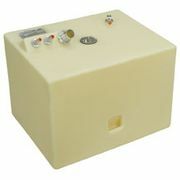 * Ideally suited for gasoline and diesel use with appropriate return kit (Part No. 035724-10). * Helping you properly secure your tank, convenient hold down grooves molded directly into tank shell work great with Moeller's Permanent Fuel Tank Hold Down Kit (Part No. 035710). * Conforms to all ABYC, NMMA and U.S. Coast Guard regulations. * Available with CE certification.